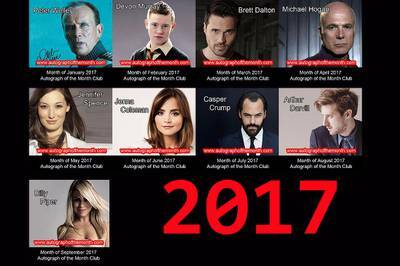 Enter your email address below to receive a notification when Autograph of the Month Club starts accepting new sign-ups! 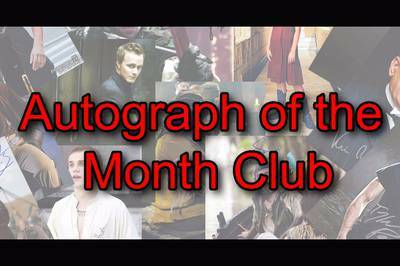 Enter your email address below to receive a notification when Autograph of the Month Club is accepting new sign-ups again. We ship out the first week of every month. You will need to be a current subscriber by the end of the month in order to get the next months shipment. So by the end of October to get Novembers Autograph. 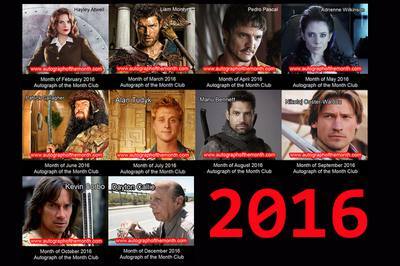 The Autograph of the Month Club! New subscribers will get a welcome kit with a bonus autograph! I absolutely LOVE this box. Although I had known about the AOTM Club for a while, I held off on starting because I was hoping for a better discount for a one year subscription paid in full. After a few months seeing my buddy get some pretty great stuff, I decided to just sign up. Although I only signed up in late December, my first package arrived, and it was an awesome Peter Weller iconic Robocop image signed 8x10, in its own protector. This was a great start. However, I did talk to my buddy who is also a subscriber, and while he also got what I think is a Robocop Peter Weller, he got some image which definitely isn't as good, and was more of an upper-chest image that is probably from Robocop, but more like a police officer's uniform. I would have expected uniformity amongst all the photos, and would recommend doing the same photo for everyone. It is easy to tell which ones are awesome and which ones are meh, and since I imagine they are paying for a certain number of hand-signed autographs from the celebrity, they should be able to get the same great picture signed for everyone. I love getting these boxes and it is something I look forward to each month. Though the first two months I wasn't all to familiar with, this months was definitely a blast from my childhood. It brought back great memories and I can't wait to see what next month brings.